This program was contributed by Jean-Paul Pelteret <jppelteret@gmail.com>. 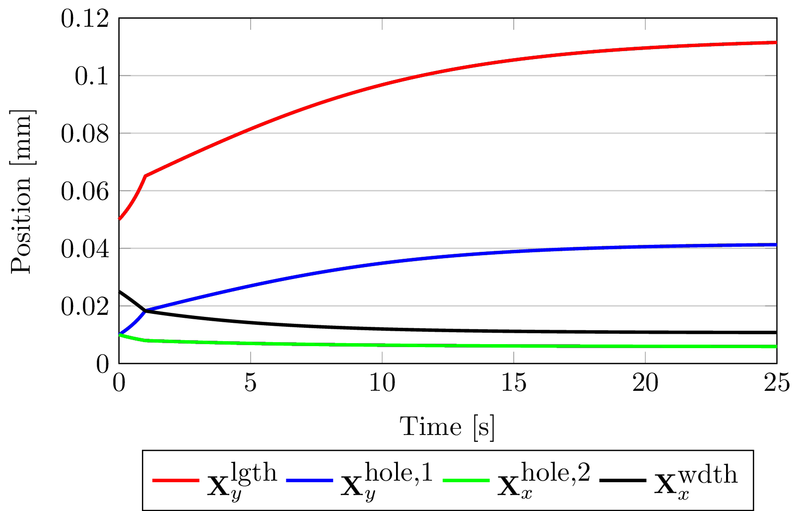 Many rubber-like materials are not only near-incompressible in nature, but also exhibit a viscoelastic response (within the tested load and time scales). In this example, we extend the near-incompressible rate-independent constitutive used in step-44 (which implements three-field quasi-static quasi-incompressible finite elasticity) to one that displays rate-dependent behavior. It may seem that there is a contradiction of terms here, so lets clarify by saying the the problem remains "quasi-static" in the sense that inertial terms remain insignificant, even though the material response itself is rate-dependent. This implies that, for these fictitious material parameters, it is assumed that the timescale for material relaxation is much longer than that of elastic wave propagation. The discerning reader will observe that we've chosen to employ deal.II's built in solvers as opposed to using Trilinos solvers. This is because the system matrices K_Jp and K_pJ, although block diagonal and well conditioned, and for some reason (perhaps pertaining to the negative definite nature of these blocks, or that the entries are very small in magnitude) Trilinos solvers are not sufficiently robust to compute inverse matrix-vector multiplication with. We do stress, however, that to date no great attempt has been made by the author to overcome this issue other than by making an entirely different choice of solver. 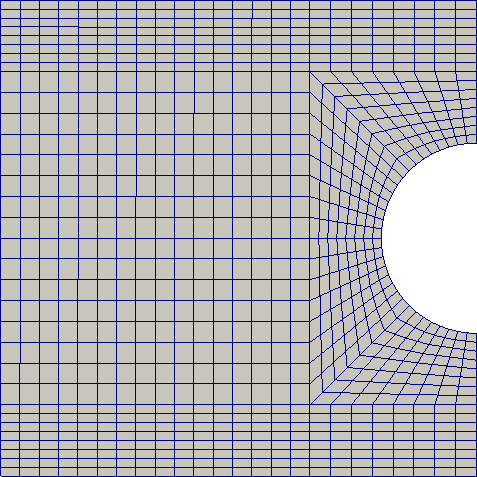 Finite deformation of a thin strip with a hole. incompressible elasticity elasto-plasticity electro-elasticity thermo-elasticity. Here we implement another permutation (one that is not necessarily benchmarked elsewhere), simply for demonstration purposes. The basic problem configuration is summarized in the following image. A thin strip of material with a circular hole is (in 3d) constrained in the Z direction and loaded in the direction of its long edge. In our implementation, this load is applied to the +Y surface and may either be displacement control (a Dirichlet condition) or a traction load (a Neumann boundary condition). Due to the symmetry of both the geometry and load, the problem can be simplified by modeling only an eighth of the geometry in 3d or a quarter in 2d. By doing so, it it necessary to then implement symmetry conditions on the surfaces coincident with the X-Z and Y-Z planes (and the X-Y plane in 3d). The +X surface, and that of the hole itself, remain traction-free. Note that, for this particular formulation, the two-dimensional case corresponds to neither plane-strain nor plane-stress conditions. This program can be run in 2d or 3d; this choice can be made by making the appropriate changes in the main() function. The support of this work by the European Research Council (ERC) through the Advanced Grant 289049 MOCOPOLY is gratefully acknowledged by the author. In particular, the relevant equations from Linder et al. 's work that are implemented in this work are equations 47, 54 and 56. Note that the time discretization for the rate-dependent internal variable for this single dissipative mechanism is only first-order accurate. and of the final, displaced grid after the load has been applied and the material is in a (near-completely) relaxed state. The following chart highlights the displacement of several vertices and clearly illustrates the viscoelastic nature of the material. During the initial phase, the load is applied over a period of time much shorter than the material's characteristic relaxation time. The material therefore exhibits a very stiff response, and relaxes as the load remains constant for the remainder of the simulation. This deformation that occurs under constant load is commonly known as creep. We've been lazy and stopped the simulation slightly prematurely, but it is clear that the material's displacement is moving asymptotically towards a equilibrium solution. You can also check what the true resting load state is by removing the dissipative mechanism (setting its shear modulus to zero) and rerunning the simulation with the material then exhibiting rate-independent behavior. Note that in this case, the number of time step over which the load is applied must likely be increased in order to ensure stability of the nonlinear problem. Just in case you found the presented chart a little dry and undigestible, below are a couple of animations that demonstrate the viscoelastic nature of the material in a more visually appealing manner. Attach a manifold to the curved boundary and refine Note: We can only guarentee that the vertices sit on the curve, so we must test with their position instead of the cell centre. << " Number of degrees of freedom per block: "
<< "[n_u, n_p, n_J] = ["
<< dofs_per_block[u_block] << ", "
<< dofs_per_block[p_block] << ", "
<< "Timestep " << time.get_timestep() << " @ "
<< time.current() << "s of "
<< std::scientific << lin_solver_output.first << " "
<< " " << error_residual_norm.u << " "
pcout << " SOLVER STEP "
<< " | LIN_IT LIN_RES RES_NORM "
<< " RES_U RES_P RES_J NU_NORM "
Construct a residual vector that has the values for all of its constrained DoFs set to zero. Construct a update vector that has the values for all of its constrained DoFs set to zero. const double time_ramp = (time.current() < parameters.load_time ? std::cerr << "Unknown exception!" << std::endl << "Aborting!"